It's strictly all for fun as Saturday 10th September sees Chesterfield's New Square Arena explode with an amazing display of dance styles with the launch of the annual 'Day of Dance'. The event kicks off at 10.30 am and a continuous programme of dance will run right through to 3.30 pm. Organisers say that there'll be a chance to find out more about various styles of dance, including Belly Dancing, Break Dancing and Salsa and perhaps have a chance to try it out. Firm favourites Chesterfield Morris and Garland Teams, Feet First Appalachian Dancers, the Byrne School of Irish Dancing, Chesterfield Caledonian Dance Class, Belly Dance Flames, Aim to Dance, Brunito with his increasingly popular Salsa Dancing and the fantastically popular Kinetic Styles Break Dancers are all back again. New for this year is Tango Chesterfield - a dance class specialising in Argentina Tango. 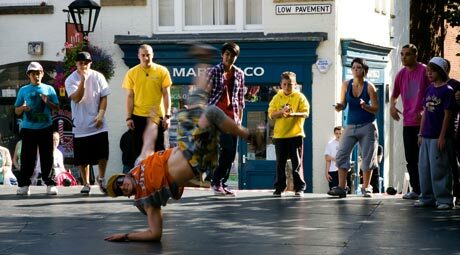 Cllr Nick Stringer, Executive Member for Leisure, Culture & Tourism at Chesterfield Borough Council said: "The Day of Dance is a great event for people to come along and watch and may inspire you to take up one of the dance styles on offer." If you like what you've seen, and want to find out more, all the dance groups performing run classes locally and will be happy to give you details. There will also be the opportunity to view Chesterfield's completed well dressing on the pump in the market place and listen to the Sheffield Barbershop Harmony Club who will be singing at various Town Centre locations from 12.30pm onwards.